We’re playing catch up on this a little bit, but the odds are there that you’ll want to see this video. 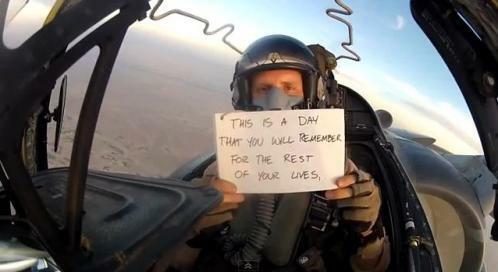 It shows a Marine fighter pilot delivering the best man speech for his brother’s wedding — while in the cockpit of a Harrier flying over Afghanistan. The Marine is Capt Matthew Krivohlavy with Marine Attack Squadron 231, according to the British Daily Mail newspaper. The pilot’s brother, Brandon, married Mandy Takacs of Austin, Texas, the newspaper added. This totally made my day. What a touching memory. Thank you for your service.